Create a look as bold as you with Maxpedition's brand new line of morale patches. 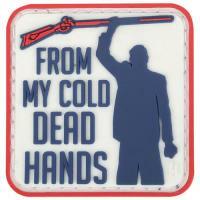 Featuring quality artwork by professional craftsmen, the "Cold Dead Hands" Morale Patch delivers an unmistakable message that is sure to stand out. An ultra-durable PVC rubber construction guarantees the resilience needed to withstand harsh tactical conditions. The patch is meticulously stitched from military-grade thread and is machine washable for easy maintenance, ensuring the patch's brilliant coloring and distinctive appearance will keep looking like new. A hook-back offers secure attachment to any loop surface and is easily transferable between uniforms, helmets and other apparel. A loop liner is included to protect the patch's backing when not in use, or for sewing onto apparel and other accessories for more permanent wear.